This week on Hit me with your shot, we dug into an early classic from Akira Kurosawa, one of cinema's greatest storytellers. The chosen film was "Throne of Blood", a Japanese re-imagining of Shakespeare's "Macbeth" starring Toshiro Mifune as our tormented "hero". And as usual, the collaboration proved successful, making for an easy translation of the famous tragedy. 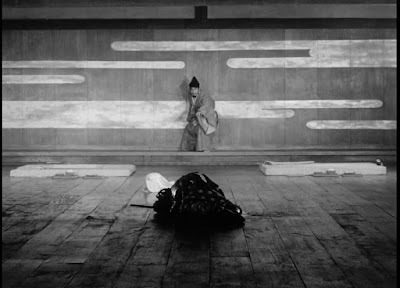 What most jumped out at me was the powerful thematic effect of the production design and cinematography in the interior settings, which provides a fascinating contrast to the more grand visual spectacle of Kurosawa's other revered Shakespeare adaption "Ran". 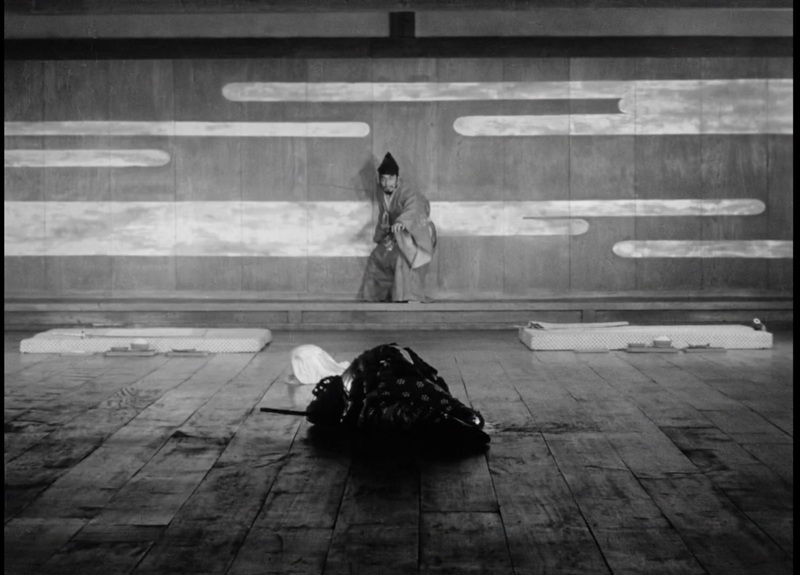 Here, the spare decor and horizontal lines convey the vast space and the wealth that implies, as well as the ample room for Washizu (Toshiro Mifune) and his wife to contemplate their guilt and literally fight their demons. Furthermore, it creates an impression of a comparatively level playing field between royalty and the commonfolk, far from the more vertical indicators (tall thrones, palatial pillars) of traditional Western aristocracies. In this scenario, the throne is a more grounded platform, making the inevitable usurping so feasible and within reach. And below, I've chosen my best shot pick as one that encompasses these elements of the art direction - the use of space, the class dynamics and the overwhelming guilt - as Washizu recoils after inflicting his latest murderous act of paranoid vengeance. Aptly positioned in the center of frame, slightly above his doomed messenger (in addition to the head of another assassinated challenger), the weight of his guilt bears down on him. 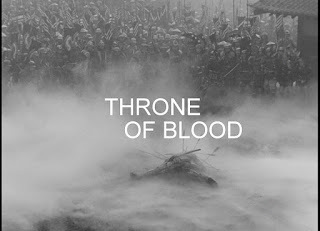 A throne of blood indeed. I LOVE this shot, one that puts you right in the audience of a Noh-style production of Macbeth. It's perfect, and I strongly considered choosing it. That camera is so perfectly placed, and the scene is blocked so well from start to finish - just like most of the indoor scenes. It's perfection.